Surgeons used microscopes to help them look for fluorescent tissue while removing tumours from the patients' brains. "The beauty of 5-ALA is that they can see where high-grade glioma is, while they're operating." Dr Paul Brennan, from Cancer Research UK, said: "Highlighting the more aggressive tumour cells in real-time could help doctors achieve the delicate balance between removing as much of the tumour as possible while preserving surrounding healthy tissue. 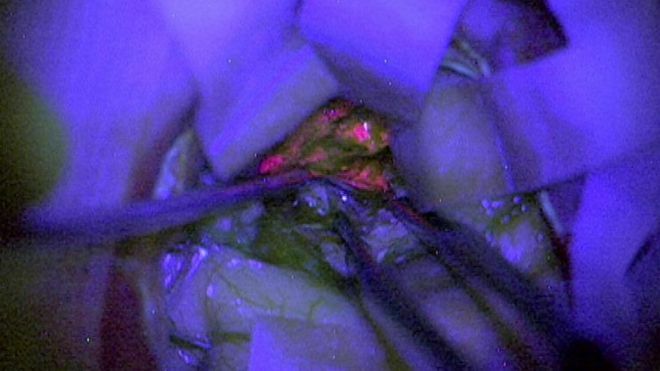 "The fluorescent marker may also ease the burden of follow-up treatment, as cancer cells left behind after surgery require additional radiotherapy or chemotherapy."